Some of the key variables of psychrometrics include temperature, relative humidity, humidity ratio, and dew point temperature. Before we get too deep, we need to answer the question, “What is air?” Some of the most accomplished IAQ consultants have a hard time describing the stuff. Briefly, air is mostly nothingness. It’s mostly empty space also known as a vacuum or void. I like to use the illustration of an empty billiards or pool table. Air isn’t complete nothingness, because we have molecules in the air. Think of these molecules as balls on that billiard table. The molecules of dry air include nitrogen (78%), oxygen (21%), and trace amounts of argon, carbon dioxide and hydrogen which make up the remaining 1%. These balls have not filled up the pool table, leaving a considerable amount of free space. When humidity is introduced to the air, it’s like adding a few more balls to the billiard table. Humidity usually represents around 1% of air by mass so it isn’t a huge contributor. You may hear people say the air is “holding” a lot of humidity or water vapor. 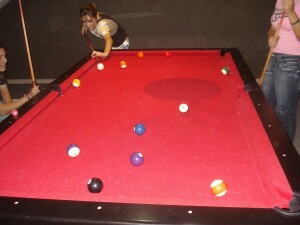 This is a misnomer as billiard balls don’t hold each other, but rather bounce off each other. How do water molecules even get into the air in the first place? Evaporation is the simple answer. Technically it has to do with the thermal energy that breaks free water molecules from the attractive forces of a liquid surface. This explains why we commonly find elevated humidity levels in warmer air. It also explains why dishes washed in warm water dry a lot faster! Warm air and water have elevated amounts of thermal energy that can free more water molecules, sending them into the air (evaporation). In the next installation, I’ll need to cover concepts such as condensation and kinetic energy. I’ll get into the juicy stuff later (vapor barriers, crawl spaces & attics, etc. ), but we first need to cover some of the basic science. I must give credit to Steve Horstmeyer, a meteorologist who set me straight on a lot of these concepts. Read Part 2 of 3. I don’t like thinking of air as “mostly nothingness”… that nothing is heat and water that drives our world! It’s good to tune into things outside the field of vision if we care about sustainability. Point well taken. I was speaking purely on a molecular level that air is mostly empty space (and not nitrogen and oxygen molecules jam packed on top of each other). Thanks for the comment… I look forward to checking out your blog Daniela!